Fire danger is staying very high for your Tuesday, but a major change of pace is ahead for your weekend forecast. The Red Flag Warning for critical fire danger will continue for your Tuesday, but is expected to expire at 5pm this evening. Well above average temperatures, gusty North winds, and very low humidity will all combine to result in the elevated fire danger today. Skies are clear for the start of your Tuesday and are expected to stay sunny through the day. Some haze will still be possible across our region from active wildfires. Temperatures have dipped into the 50's to low 70's in the valley overnight, and into the 30's to 40's in the mountains this morning. Winds are already starting out of the North up to 15mph this morning, and gusts could reach up to around 30mph out of the North this afternoon. Humidity has not recovered well at all overnight, with several cities in the valley starting out below 20 percent this morning. Humidity values will likely fall into the single digits for many areas again today. Low humidity means fires could start very easily, and the gusty North winds could result in rapid fire progression. High temperatures are projected to end up a couple of degrees hotter than yesterday. Valley areas are expected to top out in the 93 to 98 degree range this afternoon, while mountain areas climb into the high 70's to low 90's later today. The majority of mountain areas will end up in the 80's this afternoon. 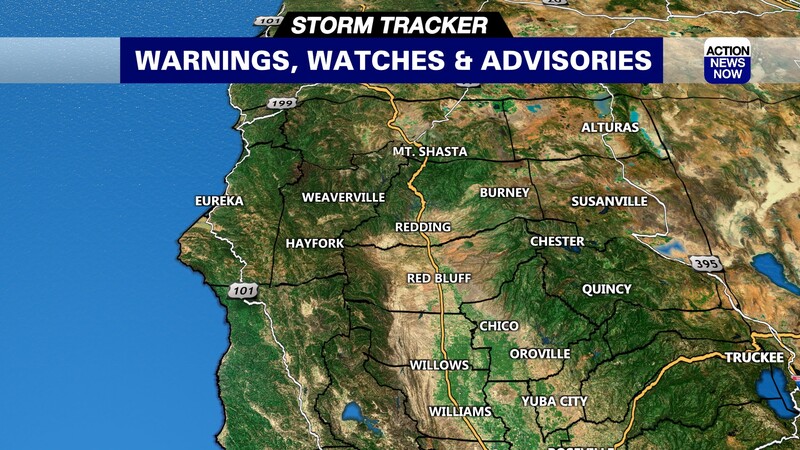 The Red Flag Warning is currently set to expire at 5pm. Temperatures will be heating up for the middle of your work week, and triple digit high temperatures will be possible for the North end of the valley. 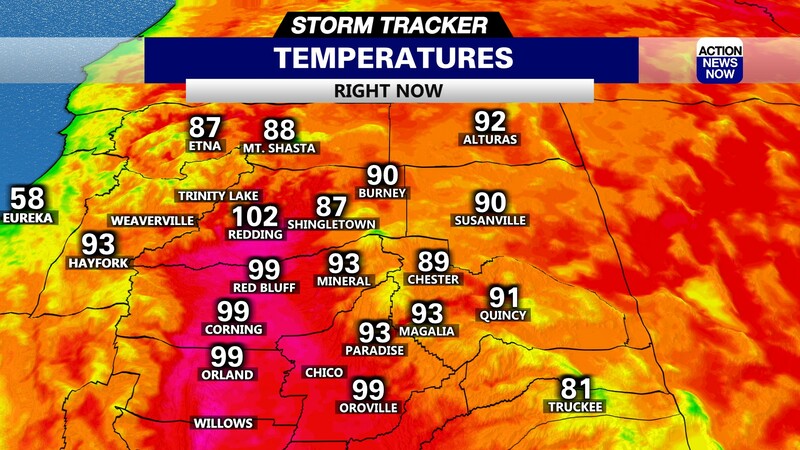 Redding is projected to climb into the triple digits for both Wednesday and Thursday. The majority of the valley will end up in the the mid to high 90's during that time, and mountain areas will be in the 80's to 90's. Despite the hotter temperatures, the Red Flag Warning is still expected to expire due to lighter winds and slightly higher humidity for the middle of the week. Temperatures will start to cool down on Friday, with most of the valley ranging from the high 80's to low 90's on Friday afternoon. A big cooling trend will impact Northern California this weekend. Low pressure in the Pacific will drive temperatures down, and will bring a chance of showers to the coastal areas and Northern zones of the state. 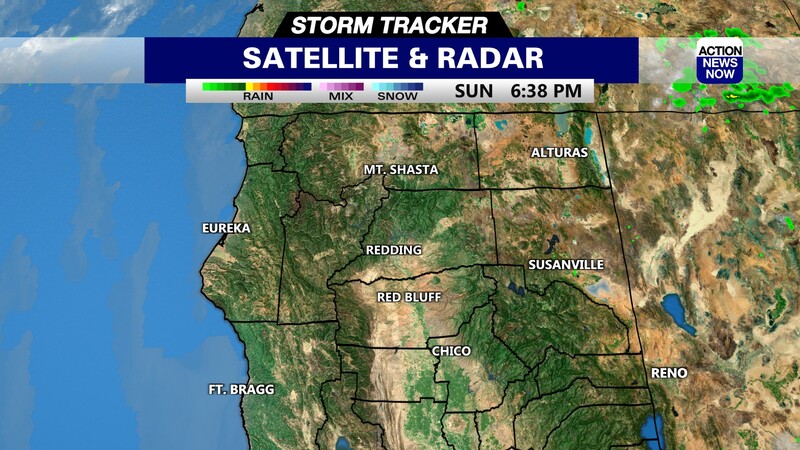 Showers are mainly expected from Shasta County to the Coast and the Oregon border, but some more wet weather could sag into our region this weekend. Temperatures will top out in the mid to high 70's both days this weekend. The cool temperatures, and potential for showers will continue into next week.